Don't even think about sneaking into the sold out Con this year! If you dislike large, fantastically dressed crowds, or are a supervillain wishing to avoid any run-ins with the superhero community, you would be wise to stay away from downtown San Diego this weekend! Comic-Con 2009 has long been sold out — not to keep rubbing it in — but, aside from Kate’s great suggestions for the ticketless masses, the Gaslamp Quarter is still the place to be this weekend, if only to get in some of the best people watching of the year. Sitting out on the patio of any restaurant in the Gaslamp Quarter gives you ringside seats to a true San Diego spectacle as our most colorful conventioneers fill the streets. 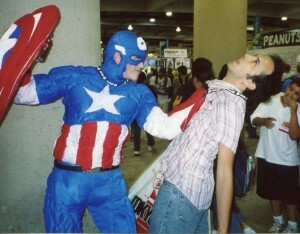 Comic-Con is a sight worth seeing both in and out of the Convention Center. So what is this bigger-than-life happening that fills our hotels, takes up our parking spaces, and crowds our buses and trolleys? Is it bird? Is it plane? What started out as 300 comic book geeks in a conference room in 1970 has grown into San Diego’s biggest annual convention, bringing over 125,000 attendees from far and wide to take part in this four-and-a-half day blizzard of popular arts and niche marketing for comic book media companies, artists, animators and Hollywood studios. Me? I don’t have passes either, but I’ll be front and center at The Tin Fish for some fish & chips and a little people/superhero/monster-watching. If I get some good shots of the spectacle, I’ll share them with you here. Until then, true believer, Excelsior! If you can make any sense of this picture, then welcome home, fanboy. Still bummed that you missed out on Con passes? Couldn’t make it to San Diego this year? You’re down but not out. 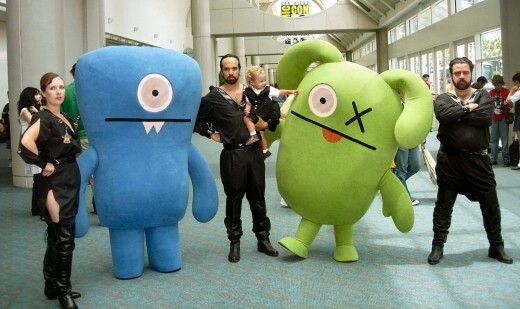 You can still keep up with the latest from Comic-Con 2009 through live blogging courtesy of the gaming site UGO. Yes, I did. 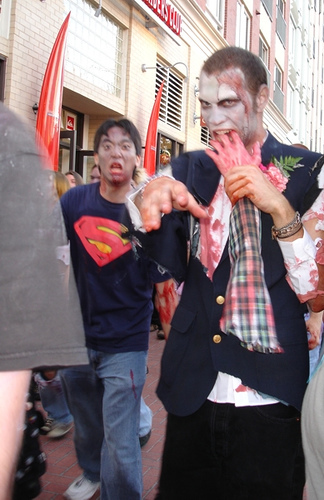 I went and got my undead on at last night’s Comic-Con Zombie Walk through the Gaslamp Quarter. You can see me lurch by at about 1:07. The undead don't need tickets! The biggest pop culture extravaganza in the nation is upon us once again. They’re back!!! Killer Tomatoes are taking over PETCO Park’s Park at the Park at 7:30 p.m. for a free outdoor double feature of Attack of the Killer Tomatoes and Return of the Killer Tomatoes – the ultimate cult movie series, famously filmed in here San Diego. The sequel marks George Clooney’s first action role. Seriously. 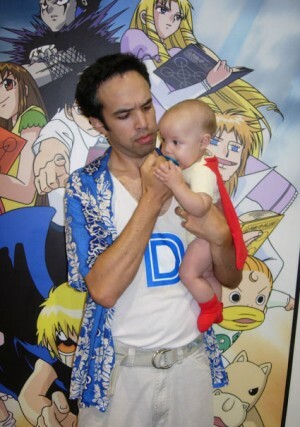 Kids are comic fans, too. Those with little ones can head up to Balboa Park at 8 p.m. and settle in on the lawn adjacent to The San Diego Museum of Art for a special family-friendly Comic-Con edition of their free Screen on the Green outdoor film series featuring animated and live action short films for kids of all ages. Unleash your inner artist at 8 p.m. at the Ruby Room in Hillcrest. Dr. Sketchy’s Anti-Art School, a regular San Diego event, is celebrating two years of doodles and drinks with burlesque beauty Lady Borgia posing and award-winning local artist (and Dr. Sketchy founder) Molly Crabapple putting pen to paper – to sketch and sign copies of her graphic novel. At noon, Tim & Eric’s Awesome Con returns to the Embarcadero Marina Park North. If you don’t know these two, there are no words… But, there will be songs, costume and trivia contests, three-legged races and, for one lucky fan, a wave runner ride with Tim & Eric. Shrimp & White Wine! At 8 p.m., Adult Swim is hosting a free roller skating jam at Skate San Diego in National City. At Robot Chicken on Wheels you can shoot the duck with stop-motion parody geniuses Seth Green, Breckin Meyer and Matthew Senrich – plus enjoy a live performance by Gym Class Heroes.